Ghadamgahi, F., Mehraban Sang Atash, M., Shahidi Bonjar, G. (2014). Comparison of Inhibitory Effects of Silver and Zinc Oxide Nanoparticles on the Growth of Plant Pathogenic Bacteria. International Journal of Advanced Biological and Biomedical Research, 2(4), 1163-1167. Farideh Ghadamgahi; Masome Mehraban Sang Atash; Gholamhosein Shahidi Bonjar. "Comparison of Inhibitory Effects of Silver and Zinc Oxide Nanoparticles on the Growth of Plant Pathogenic Bacteria". 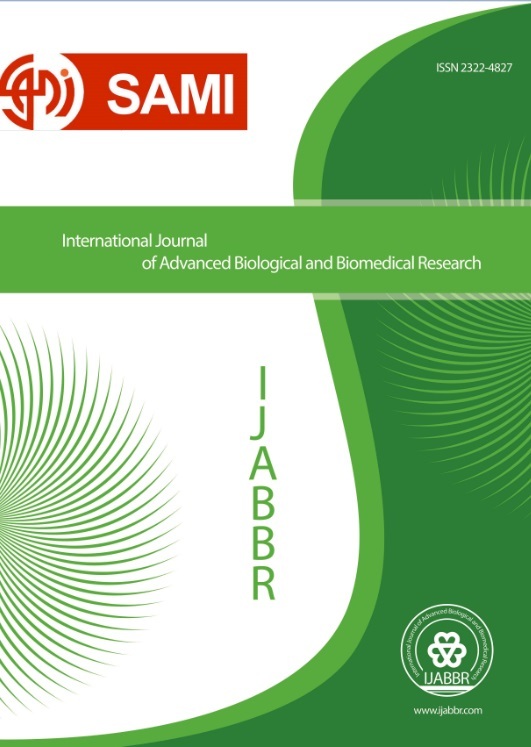 International Journal of Advanced Biological and Biomedical Research, 2, 4, 2014, 1163-1167. Ghadamgahi, F., Mehraban Sang Atash, M., Shahidi Bonjar, G. (2014). 'Comparison of Inhibitory Effects of Silver and Zinc Oxide Nanoparticles on the Growth of Plant Pathogenic Bacteria', International Journal of Advanced Biological and Biomedical Research, 2(4), pp. 1163-1167. Ghadamgahi, F., Mehraban Sang Atash, M., Shahidi Bonjar, G. Comparison of Inhibitory Effects of Silver and Zinc Oxide Nanoparticles on the Growth of Plant Pathogenic Bacteria. International Journal of Advanced Biological and Biomedical Research, 2014; 2(4): 1163-1167. In this research, the inhibitory effects of silver nanoparticles and zinc oxide nanoparticles, in vitro, on disease stone fruits bacterial canker caused by Pseudomonas syrigae pv. Syringae and disease bacterial blight caused by Xanthomonas arboricola pv. juglandis, were studied. Different concentrations of nanoparticles were prepared on Mueller Hinton agar medium in two different ways in a complete randomized design with 3 replications and controls. According to the observations both silver and zinc oxide nanoparticles had more inhibitory effect on bacteria X.arboricola than on bacteria P.syringae, and zinc oxide nanoparticles in the prepared concentrations almost had no inhibitory effect on bacterial growth on P.syringae.